After having Alby, I quickly realised that the ‘traditional’ model of care (which it really isn’t!) failed me. My worldview to that point had been founded on a very scientific model of truth – I wanted evidence, validity and reliability. And it was still wrong. Once I started on the journey to recovery, I began to explore other ways of doing things. Guided relaxation podcasts helped me sleep. Hypnotherapy taught me how to breathe and visualise. Aromatherapy let my body and mind reconnect. Embracing things I would have been sceptical of in the past happened for two reasons – I met a wonderful group of women through Know Your Midwife, and I gave myself permission to be open to the grey area. No more black and white, I was going to embrace the unknown, the intuitive, the unproven. The most important lesson I learned was that by doing this, I freed my thinking from the constraints imposed by a medical model of birth preparation. In one of our Circle groups, we learned about the history of the labyrinth in spirituality, and how it is representative of so many fundamental concepts in life. We were then encouraged to create our own, imbued with our values, memories, hopes and messages for ourselves and our babies. These labyrinth were so personal, and enabled me to deeply reflect on the things that made me truly happy, in an environment that was always supportive and celebratory. It is so much easier to be creative, to challenge old beliefs and to open up to new ideas when you know you aren’t going to be judged. 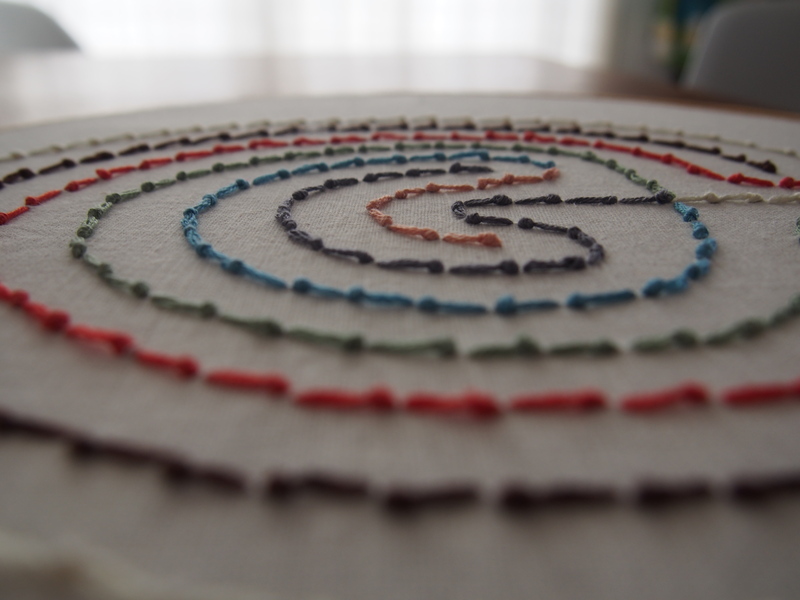 There are many variations of the labyrinth, but the key elements are the seven layers, and that there is only one path. A labyrinth is not a maze, it is a representation of a journey. If you want to read more, have a look at this explanation by Evelyn Ojeda. 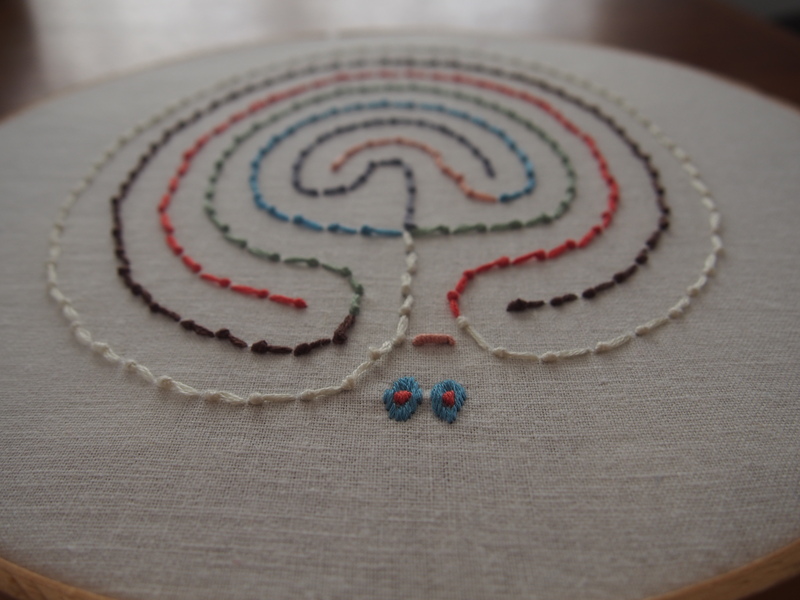 I created my labyrinth with stitches, which I felt most comfortable with. 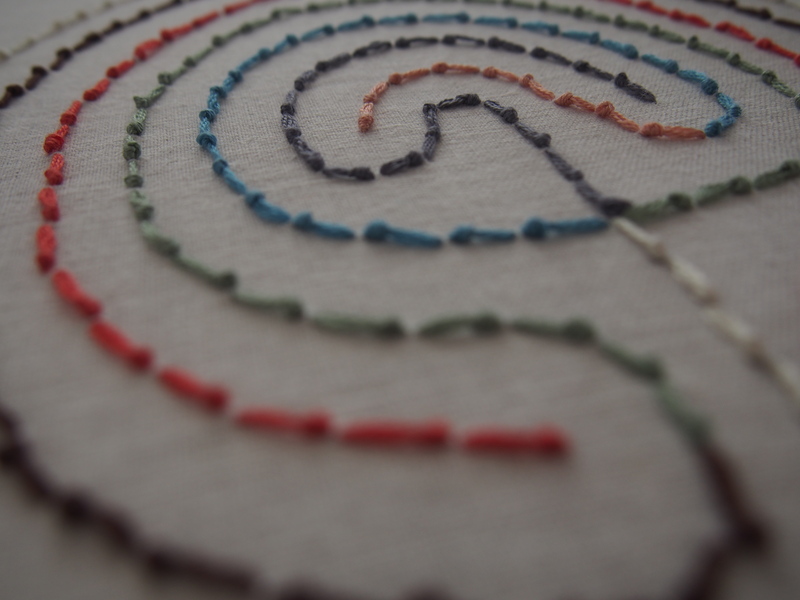 My intention was that my labyrinth would become a focus point while I was in labour, so I wanted to include as many memory triggers as possible. The fabric I used as the base I bought while on holiday in New York with my friend Emma. Each of the colours represent a person, place or time that make me happy – Alby, Brett, Clara, our wedding day, swimming with whalesharks, Rome and the ocean. I searched for examples, and there were definitely shapes that resonated with me. In the end I altered one that I found, making it more elongated, almost cerebral. At the entrance I stitched my footsteps, and embedded Clara’s on top, because this was a journey we were taking together. At the beginning of the path I embroidered a threshold, over which we would step when we were both ready to begin. The stitch I used for the edges, pistil stitch, was one I thought best represented labour – a long, smooth thread with a small knot, followed by another smooth thread. The process of creating the labyrinth was beautiful and purposeful, and gave me another opportunity to visualise what I had prepared for. When there were moments that started to become overwhelming, my labyrinth brought my focus back to where it needed to be. I think it’s a wonderful image to create when embarking on any journey, and mine will always remind me of the very long journey that Clara, Alby, Brett and I took together.